Fort Worth, Texas – The Americanization of Nelson Piquet Jr. continues in a stock car this weekend at Texas Motor Speedway, where the Brazilian with the famous surname is attempting to distance himself from an international scandal. 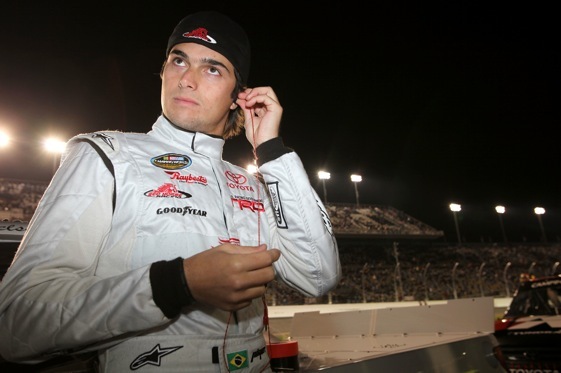 Piquet Jr., son of three-time Formula One World Driving Champion Nelson Piquet, is scheduled to make his second ARCA Racing Series start in the No. 6 Qualcomm-ESR Toyota Camry in Friday evening’s Rattlesnake 150 here. Piquet Jr. started seventh and finished 27th in his ARCA debut for Eddie Sharp Racing in the season-opener at Daytona International Speedway in February. One week later, he capped his first Speedweeks experience with a solid sixth-place result in the NASCAR Camping World Truck Series opener at DIS in his debut for team-owner Tom DeLoach and Red Horse Racing. Adapting to racing in circles – not to mention the colorful culture that surrounds it –admittedly has been a bit of information overload for Piquet Jr. Lack of funding has limited Piquet Jr.’s recent seat time to an ARCA test on TMS’ 1.5-mile quadoval in March, although he did log a second-place finish to one Julio Campos in the first Copa Chevrolet Montana race at the Autódromo Internacional in Curitiba, Brazil, last weekend. That’s as international as it gets these days for “Little Piquet,” whose F1 stint ended in disgrace. Last September, an investigation by the FIA prompted the World Motor Sport Council to formally accuse Renault of conspiring with Piquet Jr. to crash in order to deliberately alter the outcome of the 2008 Singapore Grand Prix – to the benefit of teammate and eventual winner Fernando Alonso. Piquet Jr. subsequently blew the lid off the story during his testimony in Paris, disclosing that he was instructed by his bosses to crash. “Yeah, obviously, following team orders is sometimes not the best thing,” said Piquet Jr., who has been refreshingly candid about the controversy. “The thing was, I had my manager (Flavio Briatore) and the team boss (Pat Symonds) at the table with me, so there was not much I could think at the moment. If there was only a team boss or my manager or vice versa, it’s going to be a different story. But I had 100 percent of all the canons pointing at me, and you know – what could I do? Kind of was something…a decision I took under pressure. Piquet Jr. testified that Briatore, the flamboyant team principal, and Symonds, the director of engineering, asked him shortly before the race to crash once Alonso made an unusually early refueling stop. Piquet Jr. said Symonds told him to crash around Lap 13 or 14 of the scheduled 61 in a corner where the absence of a crane would make it necessary for stewards to send out the safety car. Those events allowed Alonso to wind up with a significant advantage once the rest of the field pitted under caution. Alonso, a two-time World Driving Champion from Spain now driving for Scuderia Ferrari, has denied any knowledge of the scheme. Piquet Jr. said he agreed to the plan because Briatore was refusing to tell him if his contract would be renewed for the 2010 season. As it turned out, Piquet Jr. was fired by the team in August 2009 following a series of lackluster results. After studying some options in Europe, Piquet Jr. turned his attention to the United States, convinced his career was not permanently damaged. Piquet Jr. said he could have remained in Formula One, and certainly could have raced this season in Europe. “I spoke to other (F1) teams just to question them, and a lot of them weren’t sure if it was a good idea, because I wouldn’t attract sponsors because of all the mess,” Piquet Jr. said. “If I started working, knocking on everybody’s door I could have tried to get something over there. But it’s not what I wanted, you know? I think I stepped into Formula One with the wrong person with the wrong team and I didn’t want to take the risk of this happening (again). “And the reason I came here was not because it was the only option, was because I had a very good opportunity. People were really – not begging – but I had a good group of people really wanting me to come here, offering me a few good things. And I was ready for a big change. By staying in Europe and doing what, Le Mans Series or DTM, I wasn’t seeing a big future in that. Even if I would win the championship, I wasn’t seeing anything difficult to conquer. As it is, Piquet Jr. has found a willing mentor in Sharp, whose team in Denver, N.C., previously launched the career of Cup regular Scott Speed – another F1 refugee. “Scott Speed is a completely different personality,” Sharp said. “And I’ll leave it at that. Sharp said he has no issues with Piquet Jr.’s past, and has never questioned his integrity. “How do I look at this guy? I see someone who wants a fresh start, who is committed, who wants to make this work,” said Sharp, 45, a former driver who founded his team 11 years ago. ”I see someone who was put in a very tough political situation that there was a no-win to it. And I really haven’t put a whole lot of thought into what his past is. “What I do is I thrive on the good. And the good is for him to have made it to the level he made it to, he obviously has a tremendous amount of talent. So it’s my job to basically take that here on this side and give him every opportunity.” Sharp currently plans to enter Piquet Jr. at Michigan International Speedway on June 11 and Pocono Raceway on July 31. By then, Piquet should be well-settled into his new crib. “I’m at the moment based most of my time in Miami, and I don’t even consider it America. It’s like the closest city to Europe,” Piquet Jr. said. “America is a different country. It’s America. It doesn’t have the culture of Europe but look inside the country – there’s everything. You can be on the beach, you can be skiing, you can be out in the desert, you can be everywhere. Piquet Jr. lamented his lack of seat time, saying he would be willing to drive a Late Model, Super Late Model – almost anything – to keep his skill-set sharp and perhaps catch a sponsor’s eye. When rain canceled qualifying Thursday afternoon, Piquet Jr. wound up on-pole for the scheduled 100-lapper via 2009 owner points. He will start alongside Chad McCumbee in the No. 59 Mark Gibson Racing Dodge. “I did two races and two tests and slowly I’m getting the handle of the (ARCA) car,” said Piquet Jr., who was ninth on the practice sheet at 183.642 mph, the ninth of 37 cars posting speeds. “But not only that’s the important part but it’s also to learn the culture and to learn the people that are working in the sport. So, even not being in the car every day I’m talking to people, reading stories, watching TV a lot of different races, the tracks, the characteristics, the problems, the tricks of the drivers, speaking to drivers from other series…just watching and paying attention to things that are happening in this sport. Piquet Jr. said he has been blown away by the fan access in NASCAR. “I mean, the amount of proximity that the fans have to the sport here is amazing,” Piquet Jr. said. “I think that’s good. Sometimes it can be a bit worse for the drivers, but what builds the whole sport is the fans, the people that are watching us and support us. Piquet Jr. said learning to race on ovals has gone against everything he learned growing up in Brasilia, idolizing his father, and competing in Europe’s famed ladder series. “Obviously, it’s more difficult in a certain way,” Piquet Jr. said. “But driving in circles at 200 mph with five cars around you, the spotter screaming in your ears, having to recalculate two or three inches over here from having to back-off, being on the brakes, not being too close to the wall, not being able to touch anything because of that kind of speed with the weight of the car you’re just going to spin and hit the wall…for me, it’s tougher to run these kind of cars at the moment. Hopefully, slowly, I’ll get more and more used to it. It’s not easy. Piquet Jr. said his father, who competed in the Indianapolis 500 at the tail end of his career, has become a distant supporter of his namesake’s maverick motorsports venture.